Are you ready for a special man in your life again? You have a great life. But you know you’d like a special man to share it. You think you’re ready to date, but you haven’t done it in a while. 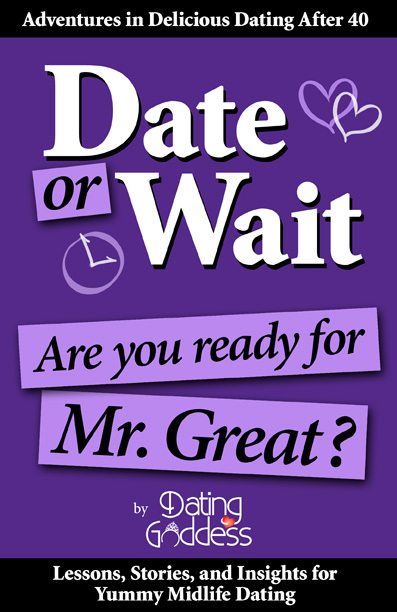 Date or Wait: Are You Ready for Mr. Great? is full of lessons, stories, insights and advice from a fellow midlife woman — the Dating Goddess — who dated 91 men in 3.5 years after her 20-year marriage dissolved. You’ll see how having an accepting and curious attitude can turn virtually any encounter into an interesting adventure — and even if it’s not, there’s a lesson for you. You’ll see how you can embrace this time in your life as an opportunity to meet “treasures” even if those men don’t turn into romantic relationships. Dating again after a long absence can create fear and trepidation. The Dating Goddess helps you understand what to expect with midlife dating through her stories of her experiences and epiphanies so you can experience dating with your eyes and heart wide open. You’ll learn how to attract interesting men and avoid those who aren’t interested in you. Since the last time you’ve dated, some things have changed, others haven’t. The Dating Goddess gives you the scoop on what you need to know, what’s changed since you last dated, and how to navigate inevitable bumps in the road. She’ll help you embrace dating in midlife with a sense of adventure and encouragement, even when you don’t meet Mr. Great on your first date — or maybe even first dozen dates. Learn from someone who has approached reentering the dating pool with verve, humor, and a unique perspective. You’ll enjoy your “date” with this book, learn some new things, reinforce others, and get started on your journey with vigor. What should you consider before you actually start dating full bore? Even if you’ve reentered the dating world, this will give you a foundation of attitude and philosophy to make your adventure more fulfilling. From the Foreword: “The Dating Goddess has provided a rare gem in Date or Wait. She offers fresh ideas on a topic that has been around as long as people have been seeking love. She blends her practical ideas, thoughtful insights and playful humor to make Date or Wait a fun, thought provoking read. Don’t delay having your first ‘date’ with the Dating Goddess. I promise that you’ll want more and more of this gifted writer’s work.” –Susan Page, bestselling author, If I’m So Wonderful Why Am I Still Single? Read Jeff Mac’s full review of this book. Read The Seductress Within’s full review of this book. Start your adventure with this book! Order it now and get the eBook version delivered in minutes! Hello, can you pls email me the link to order all 13 books at 40% off?? The shopping cart shows you the discount code before you check out.